A single 10ft diameter shaft sunk by the Butterley Company in 1859 to the Deep Soft coal at 110 yards, Deep Hard at 141 yards and Low Main at 191 yards deep. In 1909 the colliery employed 246 people below ground and 46 people above. The Manager was Mr H.O. Bishop and the Under Manager Mr W. Mellor. 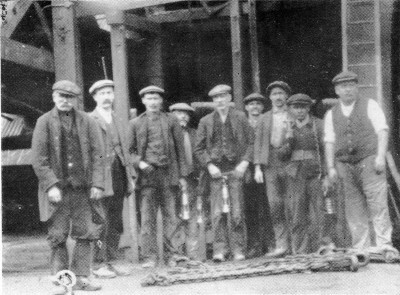 Fig.2 Waingroves Colliers; Man in the centre of the picture is Oscar Cope. The following information about Waingroves Colliery is taken from a Butterley Company Publication from 1907. Winding Engines: Single horizontal engine Cylinder, 24" diameter; length of stroke, 4'; manufactured by Thornhill and Wareham. Underground Haulage: Two main rope haulages working single drum situated on the surface. Main belt 94' by 3‘ wide. Coal is delivered on to the screens by elevator belt, and lowered in trucks by balanced lowering shoots so as to minimise breakage. The whole plant is driven by steam. Boilers: Mixed type; Lancashire, Cornish, and Egg-end. An inquest was held at Waingroves near Ripley, on Saturday, on the body of Samual Storer, who was killed on Thursday by a fall of Bind, at Waingroves Colliery, verdict:- “Accidental Death”. Deceased was 31 years of age and leaves a widow and four children. Joseph Daykin aged 19, occupation Filler, killed by fall of roof whilst filling coal 14th June 1912. Richard Clarke aged 38, occupation Stallman, killed by fall of roof 12th November 1878. John Wild aged 14, occupation Ganger, killed by fall of roof on roadway 6th January 1871. William Wright aged 14, occupation Collier, killed by fall of roof 8th April 1867. 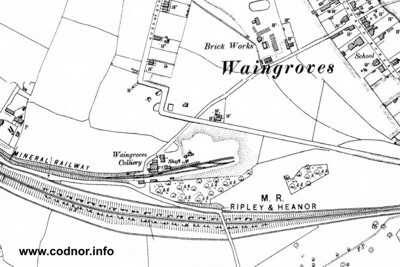 During the miners’ strike of 1921, Waingroves Colliery flooded and never re-opened. The official closing date was 22nd February 1922. 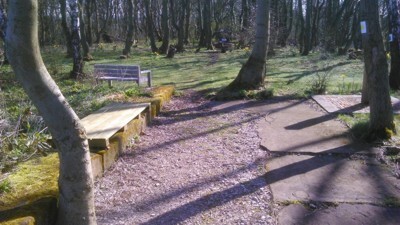 The site of Waingroves Colliery was purchased by the Waingroves Community Woodland Trust in 2010, a group dedicated to conserving and promoting the woodland as a haven for wildlife and improving access and usability for the local community. Fig.3 This picture shows the base of the old winding house and in the distance can be seen the capped shaft. Fig.4 After the colliery closed in 1922 the shaft was capped with a concrete block. 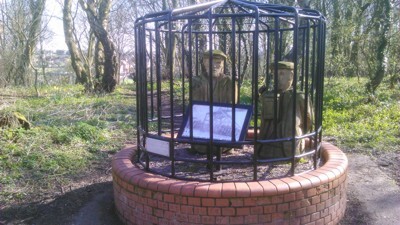 This now serves as a base for a sculpture, which is a fitting tribute to the miners who worked in the colliery.